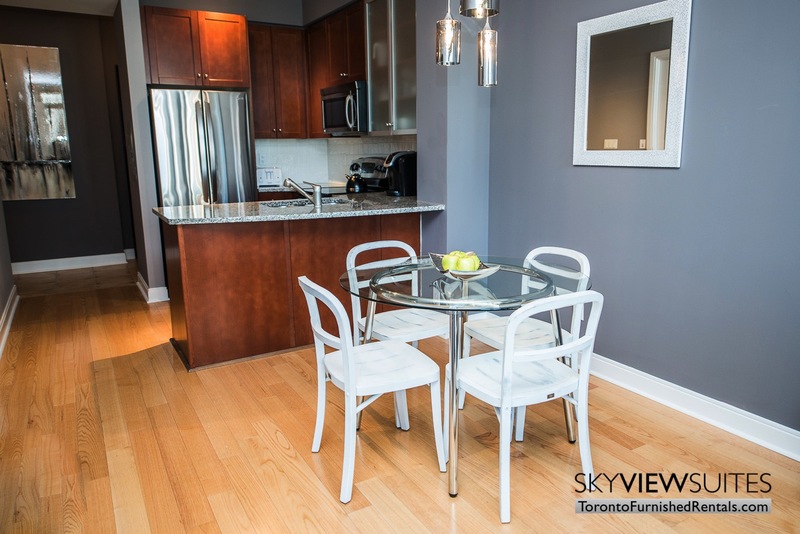 Vibrant colours and luxurious finishes adorn this bright Toronto furnished apartment. 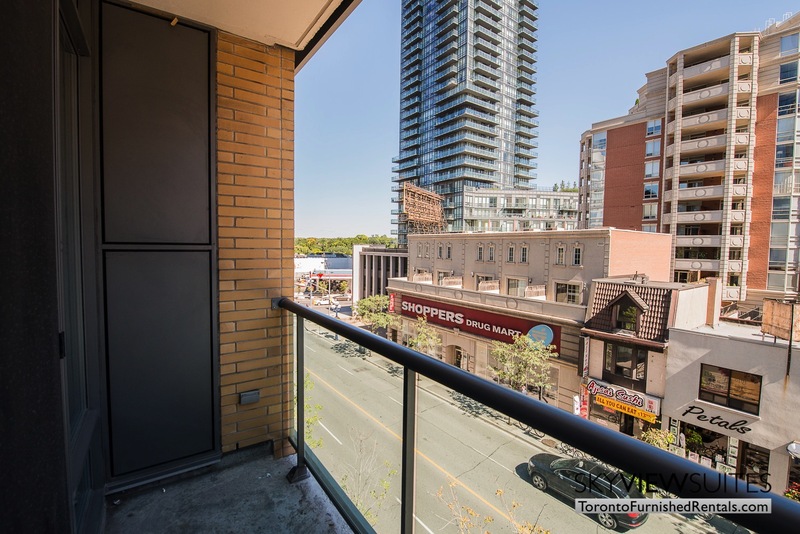 Real honey-coloured hardwood flooring throughout, floor to ceiling windows and 9ft high ceilings are some of the great features of this Yorkville suite. This one bedroom plus den furnished apartment for rent has a fully enclosed den that can also act as a second bedroom. With a queen-sized pull-out sofa in the den, weekend visitors or children can enjoy having their own room and you do not have to pay the higher price tag for a two bedroom suite. Alternatively, you can enjoy the den as a fully enclosed home office – creating the much needed separation from work. The bedroom has a comfortable queen sized bed, Barcelona chair and two rustic night tables. With no windows, you can enjoy quiet blackout sleeping – protected from any downtown city noise. All linens are provided. The bathroom has a shower and tub combination and stone finishes. All towels are provided as well. The living area features a comfortable locally made couch and beautiful accents to compliment your space – ideal for entertaining. 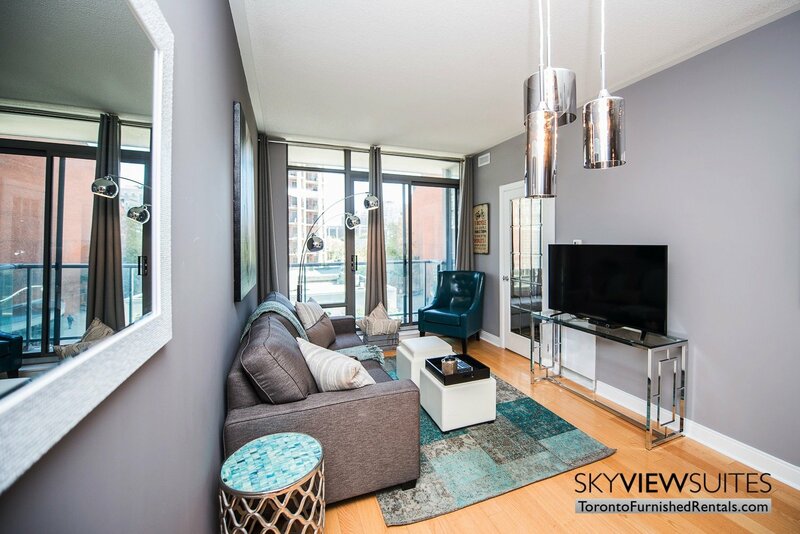 A large flat screen TV is provided and there is also a walkout accessed from the living area to the balcony. The dining space is combined with the living area and seats four comfortably. Open to the living and dining area is the kitchen, which features full sized stainless steel appliances, double thick granite counter tops and an under mount sink for easy clean-up. The kitchen is fully stocked with pots, pans, plates, cutlery and all sorts of kitchen gadgets. Also included are small kitchen appliances such as a Keurig K-cup machine, a blender and a small food processor. 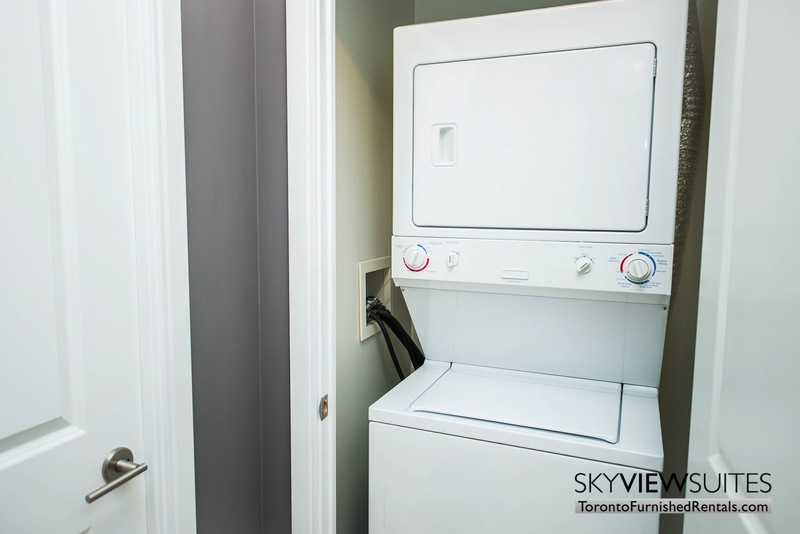 In the suite you will also find a full sized clothes washer and dryer. 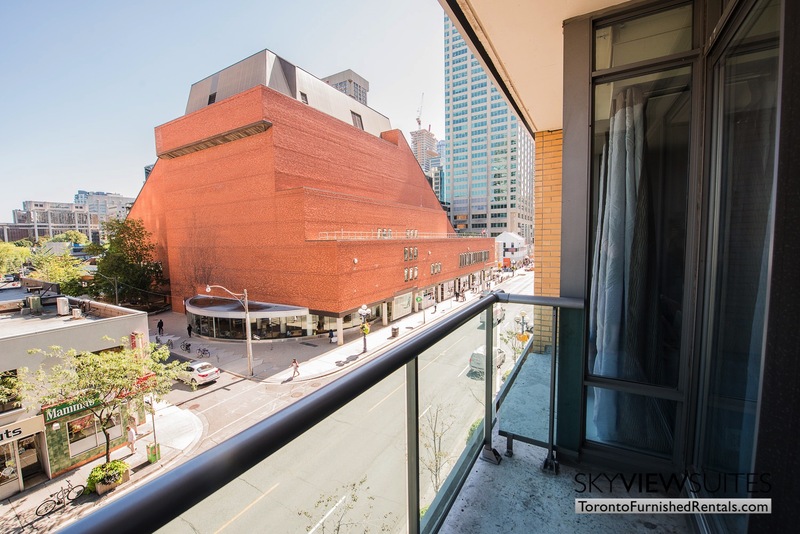 Situated in the heart of Toronto’s illustrious Yorkville neighbourhood lies our Toronto furnished living suite – Yorkville B. 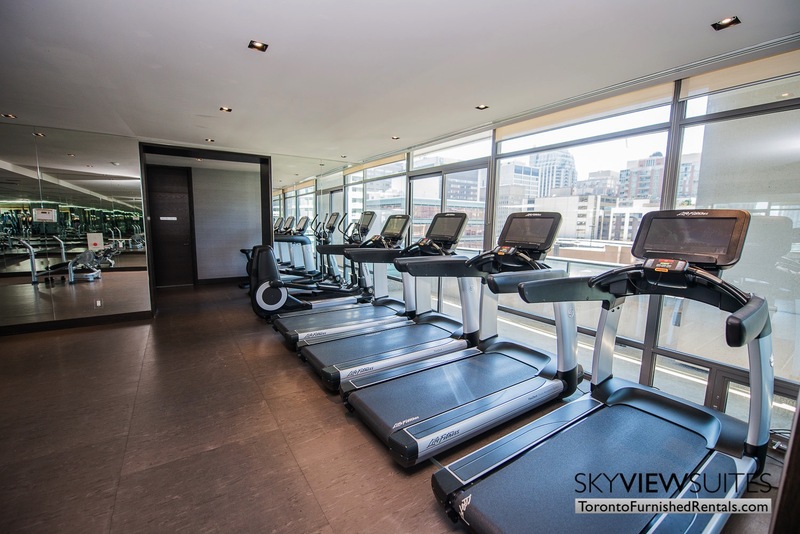 Our corporate stay guests can enjoy the very best the neighbourhood has to offer, all just seconds’ walk to the west down historic Yorkville Avenue. The eloquent laid-stone path ways lead to the very best high end shopping and dining the city has to offer. The world famous block encircled by Bloor to the south, Yorkville Ave to the north, and Bay / Avenue to the East & west respectively boasts retail presence from retailers such as Gucci, Louis Vuitton, Cartier, Prada, Burberry, and many more. For after work dining or casual drinks on the town, local favourites such as Sotto Sotto, ONE, Vaticano, Ciao Wine Bar, and Paradis will bring the connoisseur out of anyone. 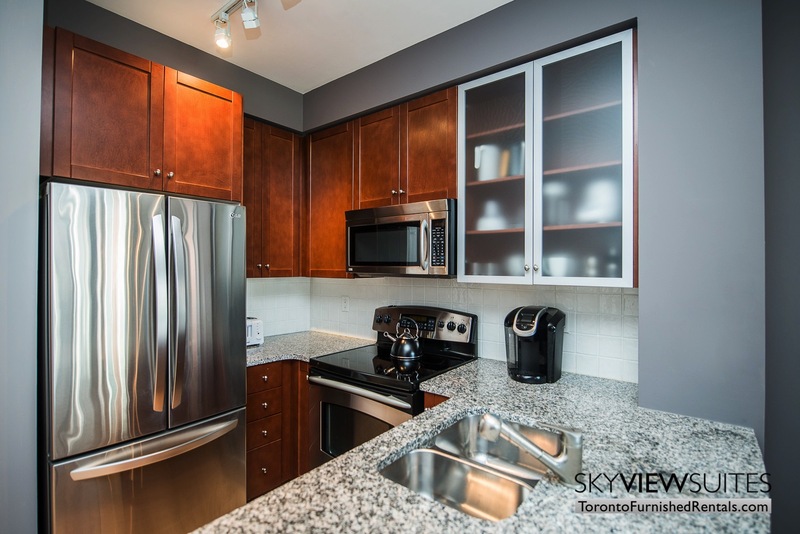 For getting to and from the office, our extended stay apartment is a mere 90 second walk to Bloor-Yonge subway station. From this point, the financial district is accessible via subway in a mere 7 minutes, or the waterfront in 10 minutes. Bloor-Yonge subway station also acts as a major junction for getting around the city to the east and west so areas such as High Park and Riverdale Park are a quick subway ride away. 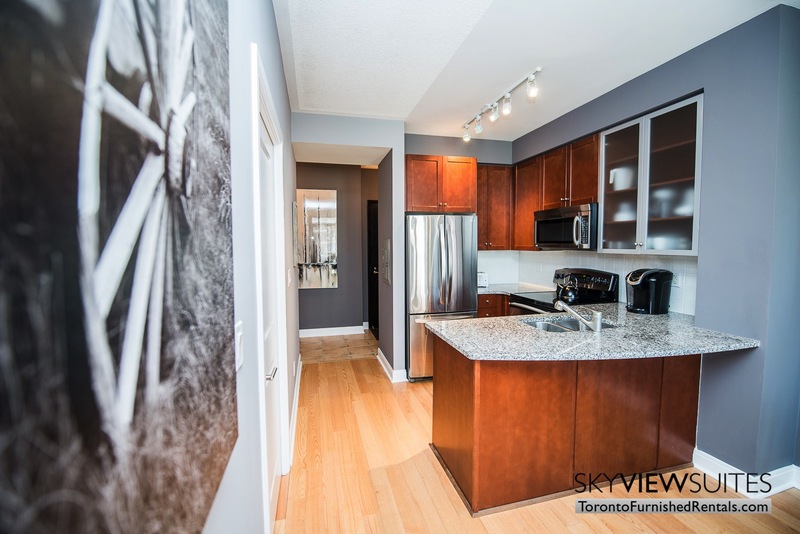 If your daily travels do not require metro or a vehicle, you will appreciate that the neighbourhood surrounding this Toronto furnished living space boasts a perfect walk score of 100/100. This means that everything that you could possibly need on a day to day basis, from groceries, errands, and banking to shopping & dining is a mere seconds walk away. Why drive to the grocery store, when Pusateri’s at Yorkville & Bay is a mere 45 second walk away? 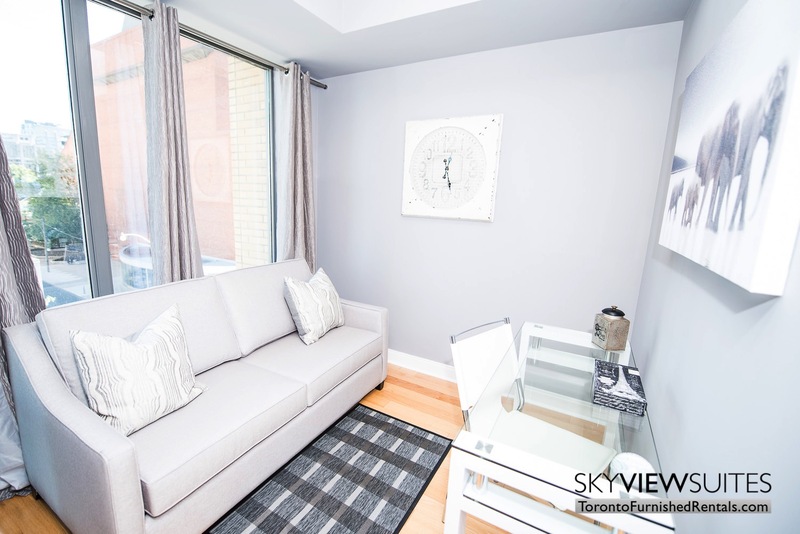 When it comes to Yorkville living at its best, our Toronto short term furnished rentals at Yorkville B are truly second to none. 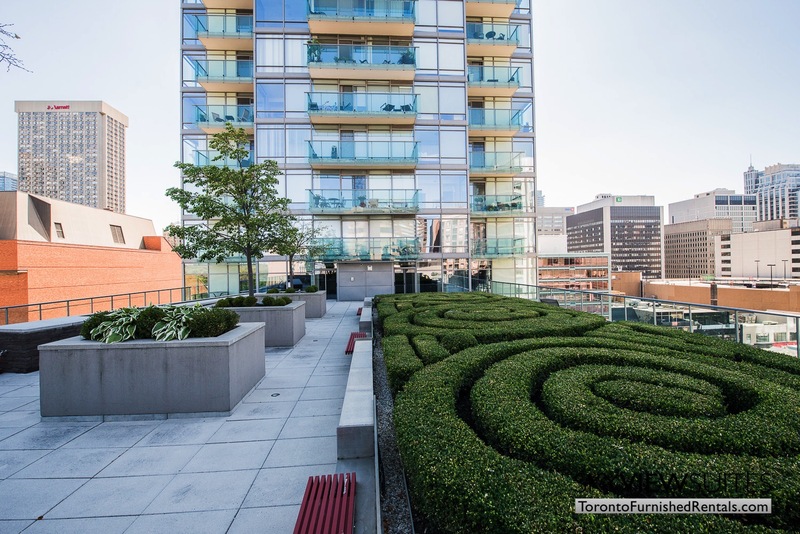 This furnished one-bedroom & den apartment is located in a dramatic 36 storey modern condo building designed by the award winning Architects Alliance, and built by Great Gulf Homes (one of the most prestigious builders in the city). The building boasts extensive amenities, spanning the entire eighth floor. This includes fitness and weights rooms, his and hers steam and change-rooms, billiard room, media room, lounges, bar, and private dining room with kitchen. This floor opens onto a spectacular roof-garden. Security is provided by staff 24/7, with 3 levels of monitored underground parking and three custom-designed high speed elevators serving the underground parking, lobby, and residences. Visitors parking for both cars and bicycles can be found on the uppermost parking level. The mail-room conveniently located within front lobby. Our corporate housing Toronto guests will also appreciate our transparent pricing philosophy, with no hidden costs or extra charges. All utilities and services are included in the advertised price. This building also has 24 hour security service.